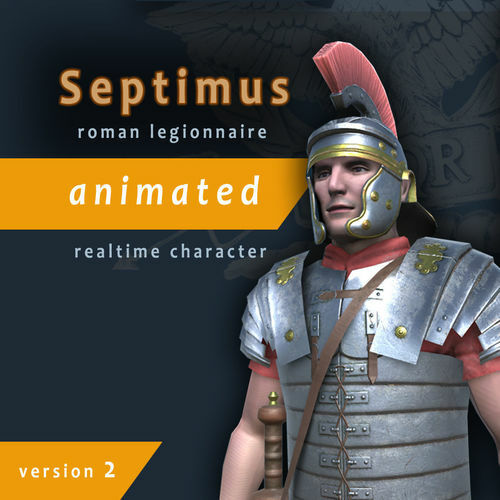 This package contains low poly rigged,skinned and animated realtime character model of roman legionnaire. 1.3D Studio 2013 max source files of the model,CAT-rigged and animated. 2.29 unique animations,each as a separate max file. Fbx. files of the model and separate fbx. for each animation. 3.Two weapons-gladius(sword) and pillum(spear).Each with corresponding animations. 6.5 texture maps in tga. format of 4K size. Albedo,ambient occlusion,metallic(with gloss in alpha channel),normal and emission. However,textures are designed to work properly in Unity game engine.If you intend to use it in other game engines or in 3D Max itself,textures and material tweaks may be required. Great looking model, had no problem setting it up in UE4. My one complaint would be the lack the walking backwards/strafing animations.